RwandAir is planning major expansion over the next three years which will see the small East African carrier add widebody aircraft and launch long-haul services. RwandAir is also pursuing further expansion of its regional network in 2015 as it expands its single-aisle fleet from seven to nine aircraft, building up feed ahead of the anticipated launch of 787 operations in 2017. The Rwanda government is supporting the ambitious expansion and sees a growing hub role for the capital Kigali. Transit passengers already accounts for about 40% of RwandAir’s traffic and the airline sees an opportunity to further boost sixth freedom traffic as well as potentially add more fifth freedom routes. RwandAir has already expanded rapidly over the last 18 months as it has replaced 737-500s with 737-700s and Dash 8-200s with Dash 8-Q400s. The carrier, which now operates a modern fleet with an average age of only four years, earlier replaced CRJ200s with CRJ900s and added 737-800s. RwandAir has undergone a major transformation since 2011 as it has renewed its entire fleet and built up Kigali into an emerging hub for sub-Sahara Africa. Passenger traffic has grown by over 50% to about 600,000, driven by new fifth and sixth freedom opportunities and surging local demand, which has also attracted an influx of foreign carriers to Kigali. RwandAir took its first 67-seat Q400 in Feb-2014, enabling to phase out its older generation Dash 8 fleet, and plans to take a second Q400 in early 2015. The renewal and expansion of the airline’s fleet began in 2011 with the delivery of two new 154-seat 737-800s. In 2012 it took two new 75-seat CRJ900s, which replaced smaller CRJ200s. In 2013 RwandAir leased two second-hand 737-700s from ILFC, replacing two ageing 737-500s. 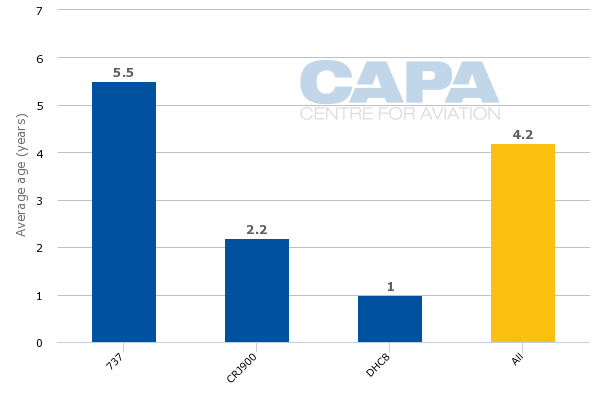 According the CAPA Fleet Database, the 737-700s are now about seven years old while the 737-800s are three years old, the CRJ900s are two years old and the Q400 is less than one year old. IOSA certification, which was awarded by IATA on 11-Dec-2014, is a major milestone and should help efforts to secure more codeshare partners. IOSA certification should also help secure approvals for launching services to China and Europe, which are envisioned under the airline’s five-year business plan. RwandAir CEO John Mirenge said in a 12-Dec-2014 video interview uploaded to YouTube by eTN that the airline plans to launch services to China “as soon as we get our widebodies and then launch Europe”. One destination in China, one in Europe and Mumbai in India are among the 25 destinations (excluding Kigali) outlined in its five-year business plan. The plan is to ultimately use the new widebody fleet to serve Mumbai non-stop from Kigali. But Mumbai could initially be launched in 2015 or 2016 using 737-800s if RwandAir is successful at securing fifth freedom rights to serve Mumbai via Dar es Salaam in Tanzania. RwandAir has been looking at 787s since 2011, when it reportedly signed up for two 787 options from Boeing during a visit to pick up its first 737-800. Boeing has not yet booked a 787 order from RwandAir and it is unclear if these options can still be exercised. But RwandAir could instead potentially look to source its planned acquisition of two 787s from leasing companies. The two 787s are in the five-year business plan along with nine single-aisle aircraft. The nine single-aisle aircraft includes the seven aircraft in the current fleet, the second Q400 which is expected to be delivered in early 2015 and a third 737-800. The third 737-800 is expected to be delivered in late 2015 and, like the first two 737-800s, will join RwandAir as a new aircraft with the Sky interior. The second Q400 and third 737-800 are sensible additions as they enable the airline to continue expanding its short and medium-haul networks, following the successful formula of the last three years. Acquiring 787s is a much more daring and riskier move but is viewed by RwandAir as an essential next step in building up the Kigali hub. The idea is the airline’s regional network will be large enough by 2017 to support long-haul flights. The current network consists of 15 African destinations (including Kigali) and Dubai, which is RwandAir’s only destination outside the continent. Dubai is currently is served with four weekly non-stop fights from Kigali, its longest route at about six hours, and three one-stop flights via Mombasa in Kenya. RwandAir currently operates 12 routes from Kigali as well as five fifth freedom routes including Mombasa-Dubai (see chart below). The Kigali-Lagos-Accra route is listed as one route because RwandAir does not have pick up rights for the Lagos-Accra sector. Entebbe-Juba, Libreville-Douala, Brazzaville-Douala and Kilimanjaro-Dar es Salaam are listed separately although all these routes originate in Kigali because RwandAir has pick-up rights for all these sectors. Foreign carriers operating the sectors but lacking pick-up rights are excluded. Airlines that only compete on a one-way basis are excluded. For example Ethiopian operates Entebbe-Kigali but not Kigali-Entebbe. On the 12 routes from Kigali, RwandAir only faces direct competition on three – Bujumbura, Entebbe and Nairobi. It is likely RwandAir will continue to not face any direct competition on most of its routes given their small size. Several of its routes are only sustainable with feed and/or tags. Rwanda is a small landlocked country with a population of about 12 million – which is small by African standards. RwandAir currently offers about 18,200 weekly seats (including the fifth freedom sectors, which account for 3,750 weekly seats). The carrier has increased seat capacity by about 30% compared to Jun-2013, when it began operating 737-700s. The expansion over the last 18 months has included additional capacity on several of its existing destinations, driven by up-gauging (from 92-seat 737-500s to 120-seat 737-700s and 37-seat Dash 8-200s to 67-seat Dash 8-Q400s) and more frequencies. RwandAir also has launched four new destinations in 2014 – Douala in Cameron, Juba in South Sudan, Kilimanjaro in Kenya and Mwanza in Tanzania. Mwanza was the most recent new route and was launched in Nov-2014 with three weekly flights from Kigali using the Q400. Kilmanjaro is served with two weekly CRJ900 flights that continue onto Dar es Salaam, a longstanding destination which is also served with five weekly non-stop CRJ900 flights. Douala is operated as a tag with Brazzaville in Congo (twice per week) and Libreville in Gabon (three times per week). The launch of Douala gave RwandAir an opportunity to increase capacity to Brazzaville and Libreville as previously the two were combined on a Kigali-Brazzaville-Libreville route. RwandAir is planning to further expand its regional network in 2015 by up to six destinations. Mr Mirenge said in the video interview that Lusaka in Zambia will be added within the next two months as RwandAir recently secured approval from South African authorities to serve Lusaka from Johannesburg. Mr Mirenge added that RwandAir also plans to launch services to Abidjan in Ivory Coast in 1Q2015 and subsequently Bamako in Mali. Abuja in Nigeria, Harare in Zimbabwe and Khartoum in Sudan could also be added in 2015. Mr Mirenge said RwandAir has already signed papers with Sudanese authorities for Khartoum, is in discussions with Nigerian authorities regarding Abuja (which would be its second Nigerian destination after Lagos) and has contacted Zimbabwean authorities to express its interest in serving Harare. The addition of Abuja, Abidjan, Bamako, Harare, Lusaka and Khartoum would give RwandAir a total of 23 destinations. The subsequent launch of Mumbai as well as one destination in Europe and one destination in China would give RwandAir a total of 26 destinations, or 25 excluding Kigali. The 23 figure includes the existing 16 destinations, the six new African destinations and the planned resumption of services to Kamembe in western Rwanda. RwandAir had to suspend services between Kigali and Kamembe, its only domestic route, on 1-Nov-2014 due to a runway improvement project at Kamembe which should be competed sometime in 2015. None of the planned new destinations for 2015 are currently served from Kigali. As these are all small markets from Rwanda, the carrier will need to rely heavily on fifth and sixth freedoms. Most of the new destinations will likely be tagged to existing destinations, following the model used recently for Juba and Doula. RwandAir also expects to continue growing transit traffic at Kigali as it builds out its network, opening to new intra-Africa city pairs. About 40% of the carrier’s traffic is now transit. This figure is expected to be significantly higher once long-haul operations commence in 2015. RwandAir has also been seeking over the last several months to launch fifth freedom services from Entebbe to Nairobi, which is already served from Kigali with 20 weekly non-stop flights. But RwandAir has so far been unable to secure Entebbe-Nairobi approvals from Kenyan authorities. Unfortunately African governments often block airlines from operating fifth freedom routes even when a market is underserved and additional competition would be an obvious boost to the local economy. Uganda is eager to open up the Entebbe-Nairobi markets to new competitor and has a more liberal stance than most African countries – in part because its flag carrier Air Uganda suspended services in mid-2014. Rwanda also has a refreshingly liberal approach and does not go out of its way to protect its flag carrier where wider benefits can be gained. For example flydubai recently was able to secure approvals from Rwanda as well as Uganda to pick up passengers between Kigali and Entebbe. As CAPA previously analysed, flydubai became the first LCC to serve Rwanda and Uganda in Sep-2014, when it launched three weekly 737-900 flights on a Dubai-Entebbe-Kigali routing. In late 2010 KLM began serving Kigali and currently serves Rwanda daily, including three A330-300 frequencies on a Amsterdam-Kigali-Amsterdam return rotation and four weekly A330-300 frequencies on an Amsterdam-Kigali-Entebbe-Amsterdam triangle routing. Brussels Airlines had been the only European carrier serving Rwanda for several years and currently operates five weekly flights to Kigali with non-stops from Brussels and stops in Entebbe or Nairobi on the return sector. Only two African carriers currently serve Rwanda, an indication of the small size of the market as well as the strength of RwandAir. Not surprisingly these two carriers are East African powerhouses Ethiopian Airlines and Kenya Airways, which are the largest airlines in East Africa by a very wide margin. Note: Shows routing from Kigali only. In some cases routing to Kigali is different. For example Brussels operates non-stop to Kigali but not from and Ethiopian operates Entebbe-Kigali but does not have any Kigali-Entebbe flights. South African Airways (SAA) pulled out of the Rwandan market in late 2013 and instead started codesharing with RwandAir on the Kigali-Johannesburg route. The relationship with SAA likely helped RwandAir recently secure Lusaka-Johannesburg rights and could potentially also help the carrier secure Harare-Johannesburg rights. South Africa typically has not been receptive to fifth freedom applications and even applications from start-ups in other African countries seeking third freedoms. RwandAir also began codesharing with Turkish Airlines after Turkish entered the Kigali market in 2013 and has a longstanding relationship with Brussels Airlines. Its other codeshare partner is Precision Air, which does not serve Kigali but provides RwandAir with domestic connections in Tanzania. RwandAir is eager to add more codeshare partners and is hopeful IOSA certification will open up doors. Prospective new partners are likely to be airlines that are looking to serve Kigali. The prospect of a partnership with RwandAir could help sway more foreign carriers to launch services to Rwanda particularly as RwandAir continues to build up its regional network. While rapid economic growth in Rwanda is attracting more foreign carriers to Rwanda in most cases the market is still too small to support new routes without feed. In addition to meeting the operational and safety standards required by international carriers, RwandAir’s in-flight product and modern fleet should be attractive to prospective partners. All of RwandAir’s aircraft are in two-class configuration – including the regional jets and turboprops – enabling it to carry premium passengers coming off long-haul flights. Following recent upgrades Kigali Airport also now offers a transfer experience and amenities that most other African airports lack. The Rwandan government has big ambitions for its aviation sector, recognising the value a hub can have to the overall economy and enabling growth in other industries. Rwanda invested in the modernisation and expansion of Kigali Airport with a just completed project that increased the airport’s capacity to about 2 million passengers per annum and significantly improved facilities including for transit passengers. But the airport, which was congested and operating above capacity prior to the upgrade, is expected again to be operating at capacity within the next five years. As a result Rwanda has been planning to construct a new airport about 25km outside Kigali which could open early next decade, providing RwandAir ample space for expansion. Rwanda expects to see further rapid growth from its flag carrier and is also confident it will continue seeing rapid growth from foreign carriers, driven in part by foreign carriers leveraging the Kigali hub status through partnerships with RwandAir. But Rwanda and RwandAir will have to be sensitive to how foreign carriers – including existing partners such as Brussels Airlines and potential future partners – could be impacted by RwandAir’s own long-haul plans. Rwanda is clearly keen to have its own flag carrier participate in the anticipated further growth of its long-haul market. But ultimately a strategy of sticking with its current regional model and focusing more on partnerships to cover markets outside Africa and the Middle East may be more viable. Rwanda is a small market and RwandAir will never have the scale to compete effectively against larger carriers. Serving growth markets such as China and India is tempting but would expose RwandAir to competition against Ethiopian Airlines and Kenya Airways, which have the scale to outmuscle any upstarts. Ethiopian and Kenya are the largest foreign carriers in the Rwanda market and are already offering connections in virtually all the China-Africa and India-Africa city pairs that RwandAir would enter as part of its five-year business plan. Africa-Europe is also a highly competitive market served by European carriers, Gulf carriers as well as Ethiopian and Kenya. RwandAir has a built up a good niche, giving it success in a region that has generally not been kind to small flag carriers. There is still room for significant further growth while keeping to the same formula.